Help others by sharing your experience in Zenobia here! Zenobia has a few options for set lunches ranging from ¥1000 (drink, salad, dips/mains, flat bread/couscous) to ¥1500 (everything as per the smaller sets plus coffee/tea and desserts). The portion sizes are not too large but filling and tasty. We tried the couscous served with a meat and vegetable stew and meatballs with bread. We were pretty hungry, so I didn't get a chance to snap a picture of our lunch, but I'll attach one of the desserts. 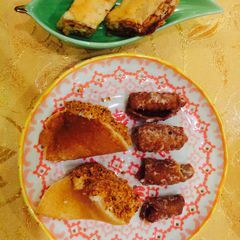 The baklava was crunchy and not too sweet. My favourite was the pancake with cream and nuts. The restaurant is located at B1.